Our compressed-air Confetti Cannons are perfect for big parties and celebrations, and the tissue-paper confetti is biodegradable! To operate, simply hold with both hands and twist the base of the unit; the confetti will blast into the air with a nice "pop"! These large Confetti Cannons are non-pyrotechnic; instead, they use compressed air to fire the confetti, which means no smoke or hot tubes after they are used! 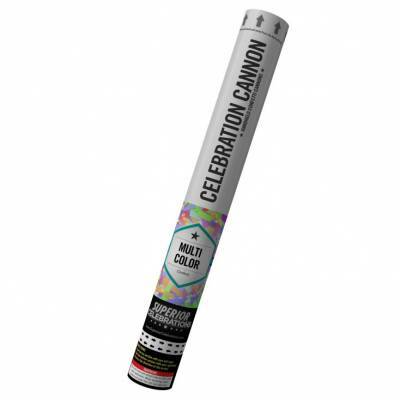 Our Confetti Cannons can be used indoors or outside, and will shoot confetti over 20ft. into the air! 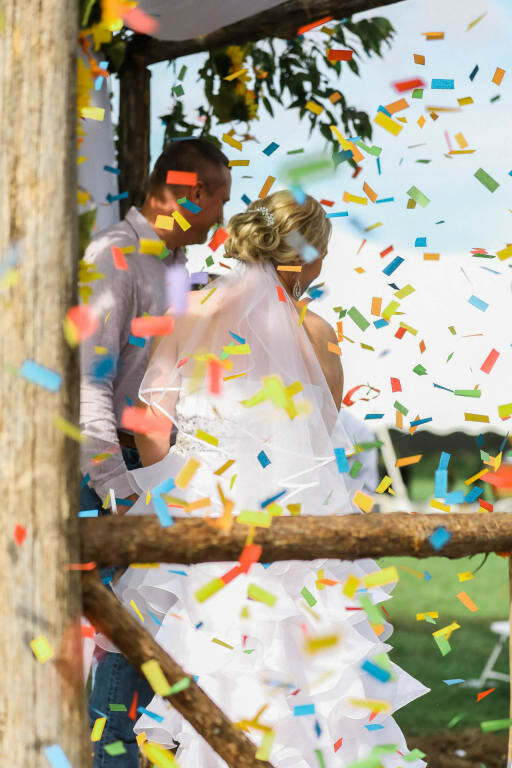 For outdoor events, we also recommend our Multi-Color Wedding Confetti Cannons with water-soluble confetti. Super colorful and amazing! Super colorful and amazing! My company used this product during the grand entrance of a wedding and the confetti fell so nice and slowly to the floor. The photographer was able to get many photos and seeing the magic on everyone's faces really makes for great photos! They are super easy to set off and there is no kickback or anything when you set it off. Can't wait to purchase more for future weddings we are a part of! Perfect for a Show Finale! Perfect for a Show Finale! We used the 4 cannons for our dance showcase finale and they were perfect! Perfect for photos! Purchased 4 of these, 6 purple, and 6 silver to use at my wedding after the big smooch. These were perfect after the purple and silver for an added pop of color in wedding photos. Stored these along with the other confetti cannons in their original box for 4 months prior to wedding. Not a single problem with any of them. Customer service is fast and friendly and kept me updated as to when the items that were out of stock were available again. I am using this product for engagement pictures! Can't wait! I loved it and received it on time !!! Thank you! !we used 2 confetti poppers for our entrance and 1 confetti popper during a wedding game that was played they were awesome and we got great pictures !! I would definitely buy this product again! I would definitely buy this product again! We used the cannon for my daughter's wedding. we gave six of them out and had them all shot off at the same time after the new Mr and Mrs were introduced. The confetti was colorful, was a colorful site in the air, and floated softly and slowly to the ground. Also is biodegradable so no real cleanup. My guests loved it and I can't tell you how many asked where I got the idea and where I bought them! Product arrived on time and in good condition. Instructions made it simple to use. Fast shipping and did the job perfectly! Fast shipping and did the job perfectly! These confetti cannons came in quick and were perfect for our end of year celebration! Thank you for the fast shipping and excellent product! Can't wait to order these again for next year! We used the confetti cannons in a parade. They were easy to use, worked great and were huge hit! Better than expected! Better than expected! I have purchased others for our school pep rallies and been disappointed. These were amazing! I will buy more for next year;s events - safe and fun! WE love the Confetti Cannons, and we will be buying more for every big event! Party Poppers at an entirely new level! Makes for festive celebrations and biodegradable paper helps ease the mind about clean up!! On time delivered as specified! I will always repurchase! I will always repurchase! This is easy to use, arrived on time, and lots of fun! I constantly get asked where I get these from! I've ordered from Superior Celebrations multiple times and can count on them to deliver a great product and a reasonable price. Thanks! Prompt delivery, nothing was missing or damaged. I bought four cannons for my colleague's retirement party. It was marvelous to shoot the cannons at the end of the party! I got it all on tape and it turned out so well! Thank you! these were perfect and performed well. we will definitely buy them again for Mobile, AL mardi gras 2019...birthplace of mardi gras. Awesome! Would definitely buy again! Awesome! Would definitely buy again! We first saw these at a gender reveal and was so impressed we bought them for my daughter's NYE themed birthday party. The kids loved them and it turned out so pretty and fun! By Cera From Washington, D.C.
No issues at all! Great company to order through. Worked just like the description! I will be buying these for every possible celebration! I will be buying these for every possible celebration! These confetti cannons shoot SO much confetti, SO high into the air! We were in awe the first time we used them. It was amazing. The confetti lingered in the air for such a long time. They totally exceeded our best expectations! Will definitely order again! Will definitely order again! Great display and works easily!